So... we have two wedding to go to this summer and both are in the south. 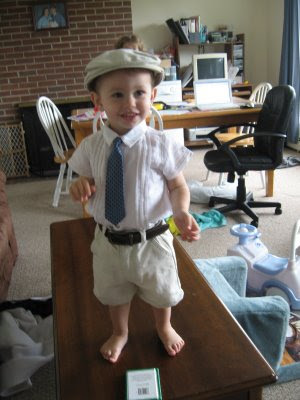 I was having a wicked hard time finding an dressy outfit suitable for the hot south for Elijah. After lots of mis-sizes, long pants and sleeves, I settled for a shirt I found on clearance at Macy's and linen pants I found at the children's place (with matching Hat). We had a Blue tie, and matching vest (not shown) already at home. The shorts were pants that I chopped off and hemmed. I haven't done clothes in a while. I'm still not a fan. I also changed the velcro on the tie to a snap, less scratchy, harder to pull off and it gives him a little bit more room. The bag is Elijah's new 'buddy bag'. He loves carrying around Eve's purses, and Jon typically discourages him wearing them (after we leave the car- he doesn't mind it up to that point). It's made from the scrap from cutting the pants. 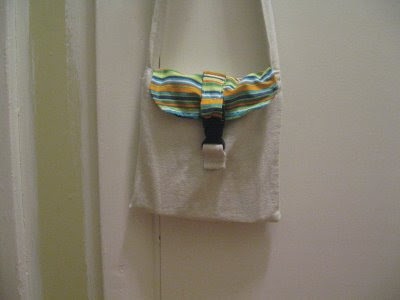 I used one pant leg for the bag and one for the strap. At first I used a snap to close it, but I changed my mind. It'd still be a couple years before he'll be able to close a snap well, and he really likes using buckles right now. Plus, I wanted to look more masculine, like a message bag, and the buckle helps to convey that look. The top picture shows our best crayons. The middle picture shows the nice side of all of them, and the last shows the truth on which ones were good and which are downright ugly. It was quite a learning experience, as you can pretty easily tell from the pictures. You can see the difference between first attempts and our last. Figuring out what to do was tricky. 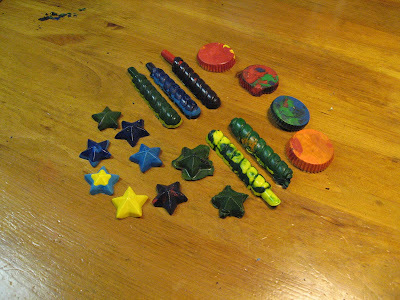 We wanted to use candy molds, so we needed to be able to pour the hot wax. So using the ol' oven-muffin-tin-and-paper-cups wasn't really do-able... And we just took out the recycling Monday, so we only had two tin cans to work with. We decided to double boil stove using the top and tins cans. Ugh. Those crayons never wanted to melt. And, I think we used too many. So, it was supposed to be a fun activity for Eve and Elijah... And they did enjoying peeling, snapping and sorting the crayons... But they grew impatient waiting... and waiting... and after making the first [ugly] crayon, we let them watch TV while we experimented with our own crayons. At least Jon and I had fun :) After we turned out our own some bad ones using the stove top method, we gave up on using molds and had the kids come in and put the rest of the pieces into muffin tins and stuck it in the oven. 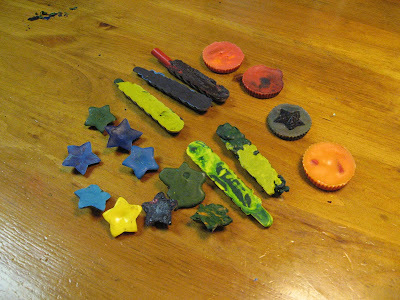 After seeing how nicely those crayons in the oven melted, I wanted to try sticking the tin cans in the oven. Those still had a hard time melting, but liquid wax did occasionally come out. So I went and got a few of my old Crayola crayons to try just a few more. I put in less crayons in the bottom of a aluminum soda can. Much, much better. They melted fast and evenly. We were able to turn out a few good ones after that. Conclusion: Fun for the adults, not as much fun for the kids. At least we'll know what to do if we try again. I think the best arrangement would be a lot of soda cans with each one devoted to a particular color group. Just pouring two together created some cool swirls. 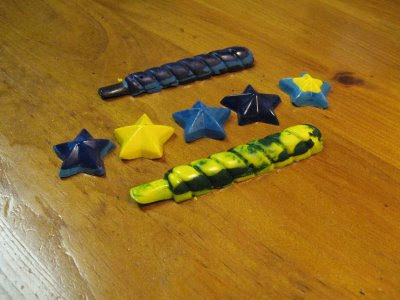 Oh, and FYI, if you use washable crayons the color sinks the bottom and only wax is left on the top. I guess I forgot to pull out one of the orange ones and messed up two of the muffin ones. Oh well. 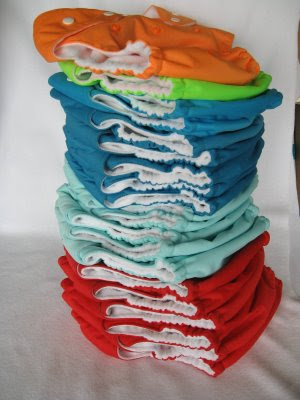 Conclusion: Would I do such a big order again? Yes, but probably not back to back. The sewing only accounted for about 6 hours of the work. Most of the time was spend cutting and snapping, which is good, because I can cut and snap while watching the kids... So Jon only had to babysit a few nights while I worked.